*The Who Am I? test involves copying and writing tasks. The copying tasks in the assessment are designed to assess the child’s ability to conceptualize and reconstruct a geometrical shape. The writing tasks assess the ability of the child to understand and use symbolic representations such as numbers, letters and words. The child’s ability to complete the tasks depends on many factors including maturity, culture, experiences, and language skills. 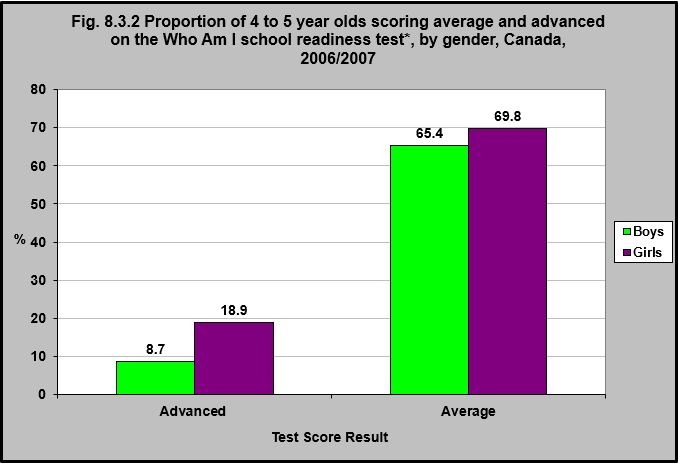 Girls are more likely to score advanced on the Who Am I test than are boys – 18.9% compared with 8.7%.